As we traverse Latin America, I've been feeding stray dogs whenever I can. I started by sharing my meals with them, but soon that didn't seem like enough. Now I carry three bowls, a stock of dog food, and a bottle of water in my backpack. I keep an eye out for strays during our rides and stop whenever possible to feed and give them water. That's how I met Suri. 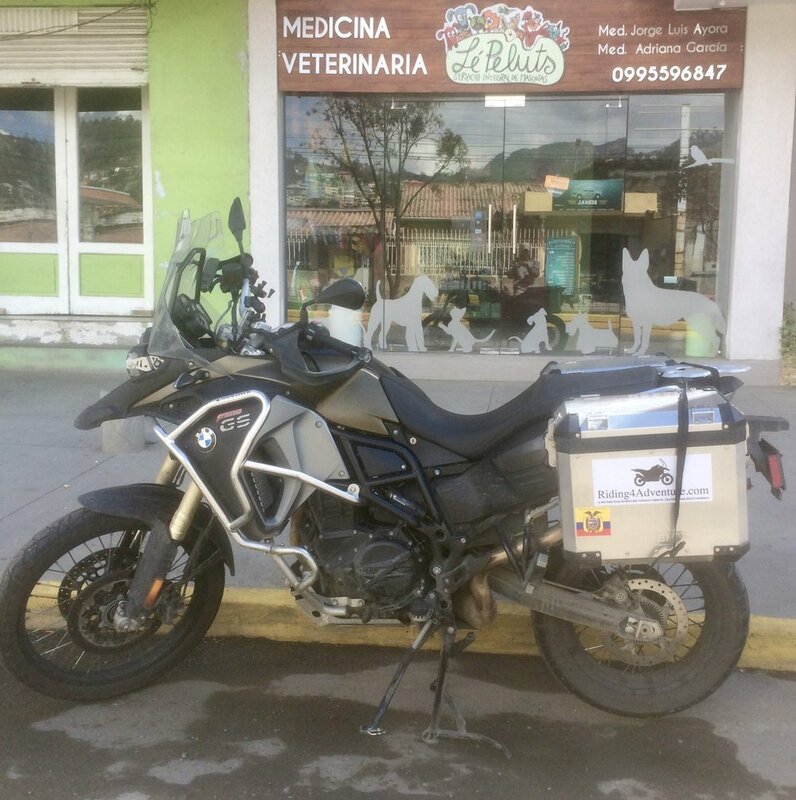 The most difficult aspect of this ride is seeing the suffering of stray animals throughout Latin America. I've seen dogs so sick they can barely move. Dogs whose face you can't see because they're completely covered with ticks. Dogs whose rear legs have been maimed by a car and now drag themselves in search of food. Dogs who remain chained with no food or water nearby. I've seen dogs being kicked, beaten, stoned, doused with hot water, run over by a car, and even hanged to death. There is one common trait in all of these dogs regardless of their breed or country of origin: they all have fear and hopelessness in their eyes. And none of them have ever experienced a touch of affection or the joy of play. While seeing these dogs' plight saddens me to the core, it's even worse when I don't see them. 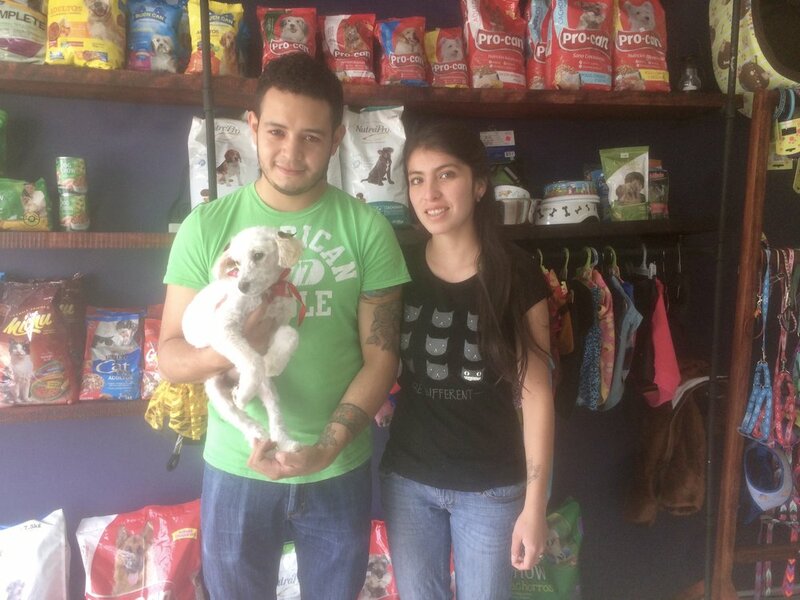 There are many Latin American communities who are taking action against their "dog problem." 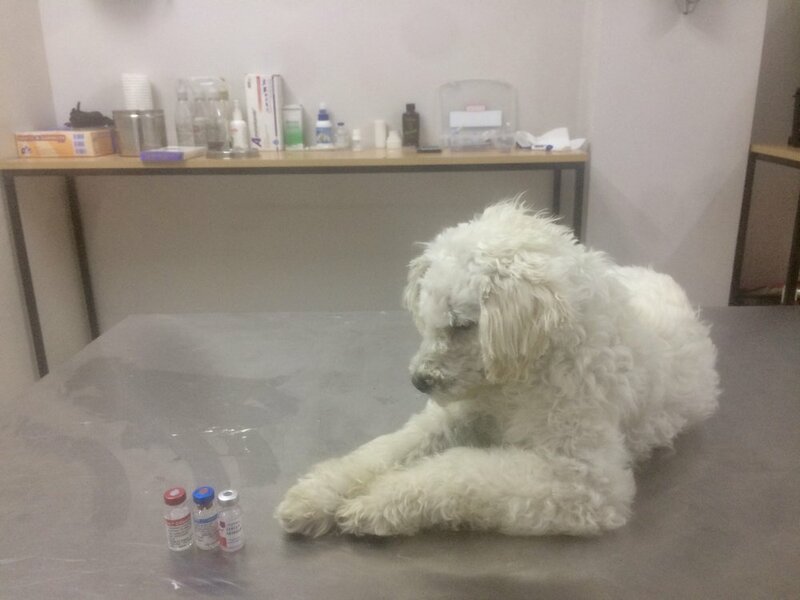 Dogs are culled or taken to municipal shelters for mass electrocution, edible poisoning, or injected cocktails of badly mixed drugs that cause excruciating pain before death finally comes. 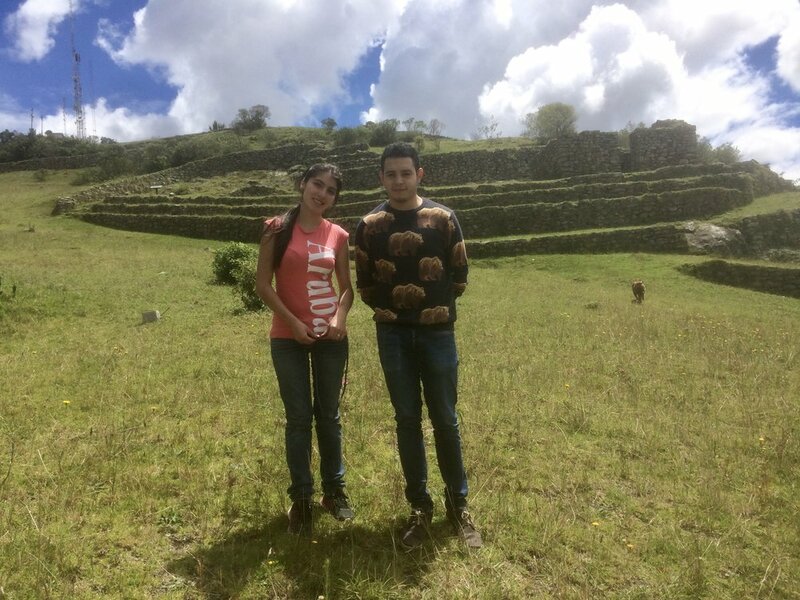 I met Suri in Ingapirca, home to one of the top archeological sites in Ecuador. Russ and I were riding our motorcycles back from a tour of the Ingapirca ruins when I saw a little white dog run into the highway, right in front of a speeding truck. I was riding behind the truck, so I hit the brakes, certain that the next image I'd see would be this little dog dead on the pavement. I knew it wouldn't make a difference to the dog, since it was already dead, but I thought it'd be best to move its body from the pavement rather than leave it there to be smashed by traffic over and over, like many others I've seen. What I saw next, though, was that little dog run right in between the wheels and to the other side of the highway, so I immediately got on the intercom: "Russ, I gotta stop to feed this little dog!" Russ has the patience of a saint and will indulge me every time. Well, feeding this little dog wasn't as easy as feeding the strays from town. She had survived in the middle of nowhere by never letting any threats near her. As soon as she saw me, she ran into the side of an abandoned structure. I tried getting close to her, but saw right away that she was frightened, so I settled for leaving some food nearby. I walked away and watched from a distance until she finally, slowly, approached the food and started to eat. It's common to see stray dogs roaming cities and towns, but this place was in the middle of nowhere, so I thought that perhaps she belonged to a home nearby. Russ and I rode for a while until we reached the very next home, but those people didn't know anything about a white dog nor were they interested in adopting. Defeated, I decided to continue our ride home, to Azogues, Ecuador. Back at the apartment that afternoon I couldn't stop thinking about the dog. What must it be like to be entirely alone, cold, and hungry? Without a plan, I got on my motorcycle and rode the hour back to Ingapirca to see if the dog was still there, and she was. The food was gone and that was a good sign, but I didn't see any sources of water, so I put water into a bowl and walked away. She went for the water with less hesitation. She was parched. As I watched from the distance, I realized that evening was approaching and it was getting very cold. I rode into town to buy some blankets or any piece of warm clothing to lay in her hiding spot, but everything was closed and by the time I returned to her place, it was pitch black. There was no way to find her, so I left. I couldn't sleep that night, so I got on my laptop to research how to trap a stray dog and that's when I learned that I was doing it all wrong. Patting your leg, calling them out, making eye contact, approaching them, etc. To a stray dog those are signs of aggression. According to the many YouTube videos I watched, what I needed to do was make myself smaller by sitting on the floor, avoid eye contact, and pretend to eat while making silly "num, num, num" sounds and dropping food scraps. Most importantly, I needed to be patient because the process could take hours, depending on the dog. I also found some information about Fundación ARCA, the Ecuadorian equivalent of the Humane Society — surely they'd be able to help. Lastly, I reached out to PETA, PETA Ecuador, and the Humane Society Latin America. I've seen so many success stories that began very much like ours on their marketing campaigns that I was certain they'd reply with advice and local resources. Uncertainty can easily turn into inaction. I'm ashamed to admit this, but I was looking for a reason to NOT do something. A reason to stop. I called Karie to explain my predicament: I don't know if the dog will be there. I don't know if I'll be able to trap her. If I manage to trap her, then what? I don't know whether I'll be able to find a home for her. On and on, the excuses. As always, Karie came back with the best advice. "Don't try to solve the entire problem at once," she said. "Break it up into small pieces. Figure out the first step without worrying about the rest. If you can solve the first problem, then work on the next. What do you need to solve now?" She asked. "I need a crate." I said. "Ok, then, go find a crate and don't worry about anything else." This, I could do. I walked from store to store and though I couldn't find a dog crate I was able to find a rabbit cage that was big enough for her. Excited about the find, I called Karie back. "What do you need to do next?" She asked. "That's easier said than done. I need to find her and bring her home." I said. "Find her first," Karie replied. I outfitted my motorcycle with the rabbit crate and headed back to Ingapirca, wondering during the hour ride whether I'd find the little dog. She was still there and just as afraid as the day before. After a couple of hours she was comfortable enough to come close to me. I thought she'd struggle once I attempted to put her in the crate but was pleasantly surprised when she simply settled down for the ride. I had solved problems one and two — find a crate and find the dog — so now I had figure out what to do with the dog. I got her on the motorcycle and started our ride toward the city of Cuenca, ARCA's headquarters. According to their website, they have a veterinarian on staff and can usually foster an animal until it's adopted. Suri's first ride on a motorcycle. ARCA is located in a small, nondescript building in the middle of Cuenca's colonial downtown. Their people are deeply committed to helping animals; unfortunately, they operate on a shoestring budget and have very limited space. Their waiting area was comprised of two chairs in a 4' by 9' space, most of which was occupied by cats in crates stacked floor to ceiling. Behind the single door was the examination room, and beyond that I could see a slightly larger room with dog crates equally stacked. Their barking and wailing was disturbing and made me wonder whether they'd be better off in the street. The veterinarian on staff was very professional and caring. She did a thorough examination and administered worm medication. She said we'd need to wait at least five days — virus' incubation period — before vaccinating her, or we'd risk major complications. They were also out of space and couldn't take a new animal. Though I had no idea what to do next, I was relieved by their space constraint. I couldn't bear the thought of leaving this little dog in one of those crates. While in Azogues, Ecuador we stayed in an apartment, so before leaving ARCA I contacted our landlord to ask for her permission to temporarily house a dog. During the ride back I tried to formulate a plan, but the best I could conjure up were fantasies: I'll find a loving family in the neighborhood who will be willing to adopt this dog. Those fantasies were dashed before I left Cuenca. I was approached by a local at a red stoplight. He asked about my motorcycle and about the dog. After asking what breed the dog was he asked if he could keep her. I considered it for a moment — a solution dropped right on my lap! Someone willing to adopt the dog without me having to search. I asked him if he had dogs. He didn't. I asked if he liked dogs. He didn't, but his neighbor has a male dog and they could breed them and sell the puppies. I wanted to find out where he lived and burn his house down. I rode away without another word. Back at the apartment Russ asked whether I had a name for the dog. I hadn't thought about it, but it was time I stopped referring to her as "the dog." Potential names floated were Maria Lopez, Chloe, Matilda, Cañarita (Russ' sugestion), and Curly. I settled for Suri. Sur means south in Spanish, and I added the i at the end to give it a girly sound. By this time my fantasies changed from finding her a loving home in Ecuador to finding a way to bring her to the United States. She could fly there or ride with me. It was fun to think about this, but I didn't think either of them was feasible. That is until I spoke with Karie. Our landlord gladly agreed to let us bring Suri into the apartment and, as our luck would have it, she also had a recommendation for a veterinarian — Lé Peluts — within walking distance of the apartment. The next morning Suri and I were at their door an hour before they opened. 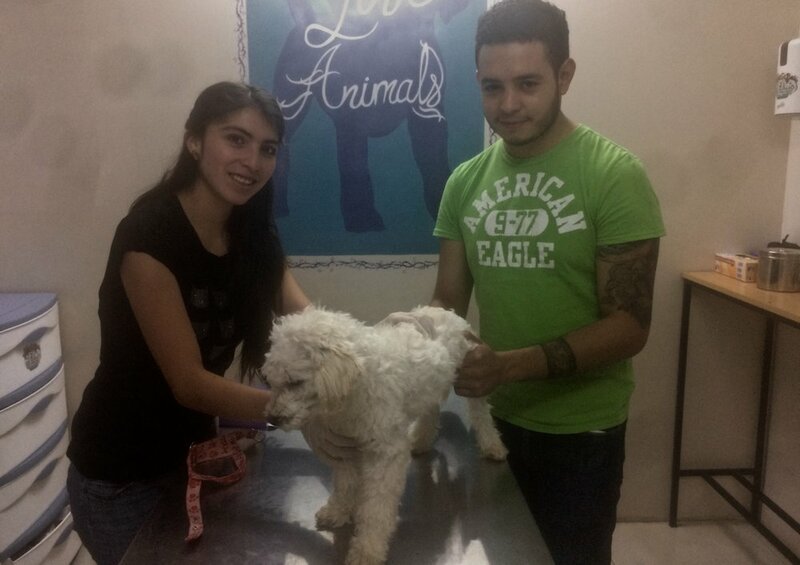 Lé Peluts is owned and operated by a young couple, Jorge Luis Aroya and Adri Garcia, whose compassion and commitment came through as soon as they began treating Suri. Jorge Luis and Adri helped me formulate a plan to bring Suri along for the ride. 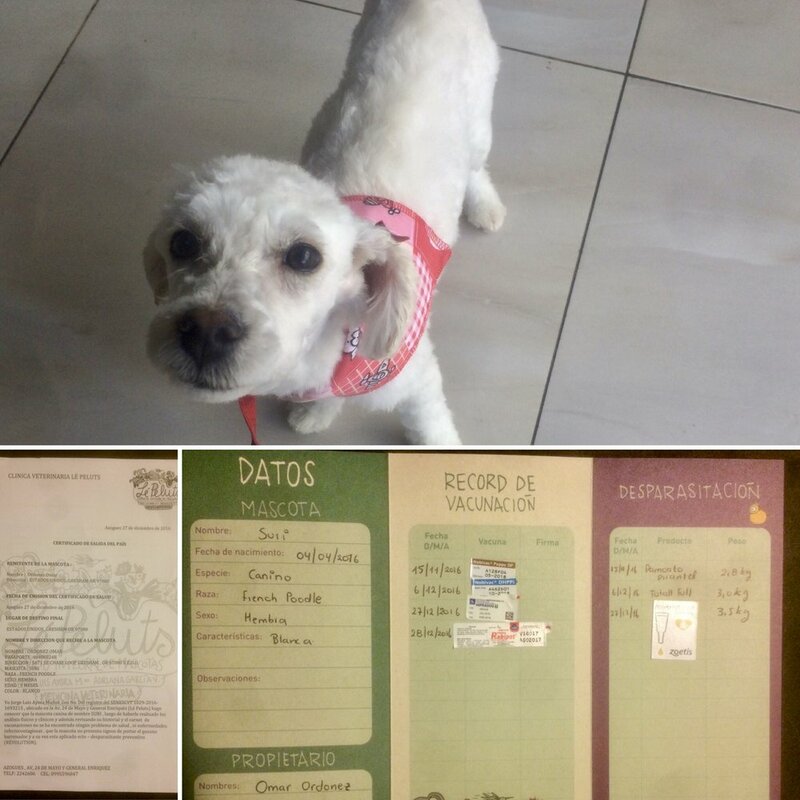 They vaccinated and spayed her, and drew up all the documentation needed for her travel. I can't thank them enough for what they've done for Suri, and what they're now doing for Sunshine (the subject of a future post). While Suri's treatment and documentation were being done, I worked on her transportation. First, I needed to clear up space on my motorcycle. Russ and I went through all of our equipment, set aside everything that we could do without and gave it away to friends in Azogues. Russ kindly offered to carry some of my equipment on his motorcycle and this removed an entire piece of luggage (my red duffle bag) to make room for Suri's crate. After searching every major store I was still unable to find a dog crate, so I used my empty red duffle bag as a base for the rabbit cage and reinforced its structure by weaving strong straps used for shipping. I attached the cage to the motorcycle using strong towing straps. Lastly, I cut a poncho and used it for protection against the sun and wind. I reached out again to all of these organizations through email, phone, and Facebook, and was disappointed by their response, which was none. I've been a monthly contributor to PETA and the Humane Society and have always found their success stories encouraging. I can see when they read my messages on Facebook, so I can't understand why they wouldn't respond even to say they couldn't help. I know two wrongs don't make a right, but I've cancelled my monthly contributions until I've had an opportunity to think about what to do next. 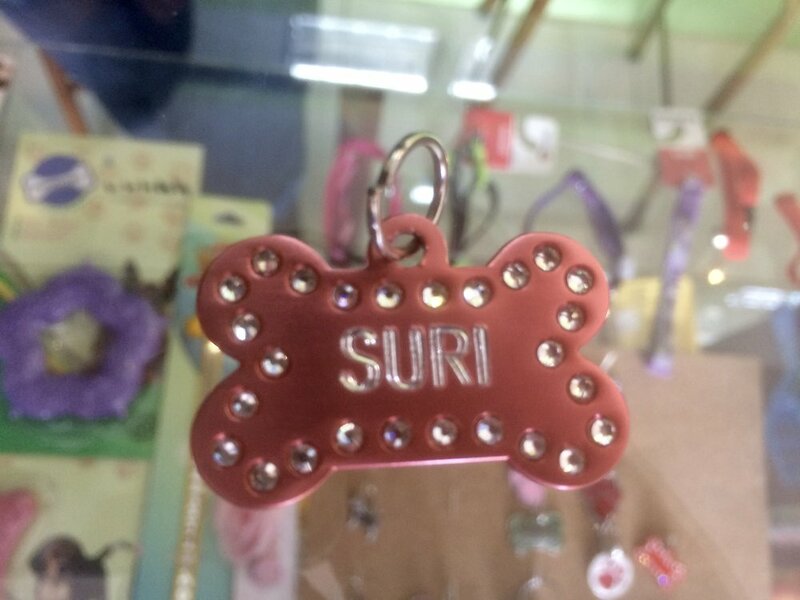 For now I'm using those funds for Suri's care. I decided to bring Suri on the road to travel the rest of the way south, to the tip of South America, and then back home to the United States with us. I was concerned about the toll it would take on her being on the road on a motorcycle, so we're doing everything to ensure her safety and comfort. To make the trip less strenuous we've reduced the number of miles we travel each day and stop every couple of hours to stretch those paws and get a little water and nibble. We also make sure that at every destination she gets an opportunity to walk, run, and play daily. We've traveled over a thousand miles so far and crossed the border between Ecuador and Peru and everything seems to be working really well. Most importantly, Suri seems to be enjoying the adventure!